Mum had just returned from her first session of intravenous vitamin C. She’d taken a bag full of books on cancer to keep her busy – but she needn’t have bothered. During the hour and a half it took for the vitamin solution to transfuse, she’d made friends and swapped stories about everything from hydrogen peroxide and coffee enemas to mobile phone protectors and where to buy organic, yeast-free spelt bread (according to Paul, it’s best grain to eat if you have cancer). Paul is an inspiration for anyone who becomes part of the regular IV drip crew. He was diagnosed with liver cancer two years ago, and, with two small children, he’s determined to stick around. The cancer meant he had to quit his job as a pilot and he has since spent his time reading everything there is to know about alternative cancer treatments – and sharing his knowledge with anyone who’s interested. Apparently it’s like the second coming when Paul arrives, always amid a chorus of ‘Paul what do you think about magnetic healing…’or ‘ Paul can you tell me the name of that website again?’ He is currently writing a book about cancer, which Mum and I (and the rest of Paul’s disciples) are eagerly anticipating. But for now… back to IV Vitamin C.
How does it work, and why do you need to inject it? ‘ Instead of treating cancer with chemotherapy, you can give intravenous Vitamin C at, 30, 60, 100,000 milligrams a day, directly into the bloodstream and that will kill cancer cells. With vitamin C, there is no damage to healthy cells,’ says Andrew Saul in the revolutionary film Food Matters , which mum happened to watch just before her diagnosis. In the 1970s Dr Linus Pauling and Dr Ewan Cameron conducted a number of studies, looking at the efficacy of Vitamin C in cancer patients. In 1971, 100 terminal cancer patients were given 10g (10,000 mg) of vitamin C intravenously a day, compared to a control group of 1000 patients who were treated by conventional methods. (Just to give you some idea of how much Vitamin C we’re talking – the RDA is 80mg). A more recent study, mentioned in Patrick Holford’s fantastic book Say No To Cancer ( Piatkus), was carried out by researchers from Saga University in Japan. They found that cancer patients on 5-30 g of vitamin C lived six times longer than those on 4g or less, while those suffering from cancer of the uterus lived 15 times longer on vitamin C therapy. So why haven’t we heard more about high-dose vitamin C? Firstly there’s no money in it for pharmaceutical companies; secondly, unlike chemo, it’s not subsidized by the government so it can leave you out of pocket; and thirdly Pauling and Cameron’s study was discredited by a similar trial, undertaken by the Mayo Clinic in the US, which found no difference in survival rates for those given vitamin C.
But there was one key difference between the two studies. While Pauling and Cameron administered 10g vitamin C by IV, the Mayo participants were given the same dose orally. So why does vitamin C work so well when it’s injected? I like the image of bloated-cancer cells bursting. I also like a story I read this week, about a German doctor, bursting the bubble of a drug-company salesman. Hello Laura…remarkable ! I would be grateful to know where Paul is and how I can contact him please? Family member in desperate need of help….. Thank you so much. Good luck Mum !! 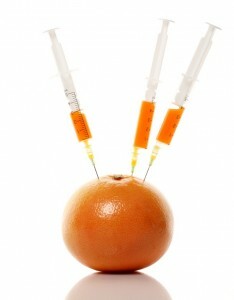 Your blogg is full of helpful info, my first read tonight and im thinking Vit C injections are for me. However, do you (or anyone else) know if i can have it whilst undergoing Chemo (currently?). Hi Ali – you can absolutely have vitamin C injections alongside Chemo. According to Dr Ian Brighthope: ‘It reduces the toxic effects of chemotherapy, it boosts the immune system and stimulates white blood cells to mop up dead cancerous tissue and fight infection.’ Thanks for your comments Ali and I hope your treatment is going well! You must take part in a contest for one of the most effective blogs and forums over the internet. I can propose this web site! Love the article good work! I’m using similar methods to treat my own disease, which is a hideous neurological and cardiac one similar to MS, that has left me housebound and bedbound for the last 10 years plus. After 10 years or worsening, slowly I am improving…very very slowly. Vitamin C in liposomal form (as effective as IV but not as much hassle!) and FIR sauna use are major components of my program, plus the Weston A Price diet, minus dairy and grains. Thanks so much for all your hard work in doing the site and I wish you better health and lots of hits to your iste this week, and beyond. You deserve it! Thank you for your advice and information. Do you happen to know where my husband can go to have VIT C in the western suburbs, happy to travel if need be but close to Mount Claremont would be a benefit. I have an orange tree out the back…for over 20 years I have benefited from the freshly squeezed juice. After your comments on the benefits of Vitamin C I will definately not be letting any fruit go to waste and will appreciate my “Golden Harvest” even more!! Nature again has provided the “Magic Tonic”! Good Luck with the Vitamin C Therapy. Just saw it in the advertiser today. Can anyone help me out and tell me if there is somewhere in South Australia, Adelaide that you can access IV vitamin C or this peroxide treatment that you describe? I know how you feel, my mom was diagnosed with stage 3 non-small cell lung canecr in May, they did radiation and chemo which got rid of the canecr in her lung and lymph nodes in and between her lungs. But, it had spread into her bones and several other lymph nodes, they did more radiation and chemo but she and was only given a few months to live, that was in mid-august. I could not accept losing my mom who is only 43 so I did a lot of research and found what I feel is her best hope. Maybe a good option for your friend , too, there are a lot of Breast canecr patients here as well. Also, while she is doing shemo look into interveneous vitamin C, you would probably have to do it through an alternative doctor, because mainstream doctors unfortunately are not well versed in natural supplements. I listed a few links for vitamin c info at the end.I am currently in the Bahamas with my mother. There is a clinic here that has been in operation for over 30 years. We have been here for 4 of our 8 week stay, everyday is really inspiring. A lot of the patients stick around in the meeting room/ waiting room to visit, and share stories and catch up. There are 40 people all talking and laughing, talking about canecr and life. The returning patients talk about how bad their canecr was 4, 8, 10, 18 even 28 years ago when they started coming to the clinic, the canecr that has since disappeared. There is nothing dangerous or foreign to the treatment, just building up your immune system in a very effective manner that allows it to identify and fight the canecr. If you want to know more contact me or go to I cannot tell you how impressed I am with what I have seen and how my mother has already improved. I know one man who was diagnosed with pancreatic canecr, he skipped all US, conventional (poisonous, dangerous) options and went to the Bahamas and is doing great now. Another man who has been coming here for 18 years that had prostate canecr. People with just about every type of canecr. But, they are honest here, you send them your medical information and they will tell you whether they believe they can help you or not, and they will send you home if they don’t think you are benefiting. My mom has shown drastic improvements and is feeling so much better. and we are in the Bahamas so we are having a good Mother-Daughter vacation. When we got here she was on 75 mg of morphine a day plus 6ml of liquid morphine a day, now she rarely takes any morphine, and only occasionally takes Advil. Some of the pain she does get is associated with tumor kill, it happens to most patients as their immune system begins quickly destroying the canecr cells, it is a good thing.There are a lot of alternative treatments out there worth looking into. I have also done a lot of research on the Cesium Chloride/DMSO treatment and think that it has merit and you can do it at home.The clinic here believes that a supplement/liquid called VIBE works really well in addition to other treatments, I am going to look in to that some more.One very helpful website isUS doctors push chemo and radiation, but when you look at the statistics and side effects it is not a good option for most people. My Mom had both before we came here and now that I know more about them and have researched them I feel horrible that I let her go through them. She was lucky (so far) the only long term side effect she has shown is short term memory loss. The stories I have heard from the other patients here about how they were treated by US medicine astound me. One lady went home to have a shunt put in her liver so she would be ok to come here, but they refused to put it in unless she agreed to do chemotherapy, is that what our country is about? Denying helpful procedures unless we agree to dangerous, toxic ones? The drug companies run US medicine at least when it comes to canecr treatment and it is sad. Most doctors will tell you not to try alternative medicine and some will refuse to even see you again if you do. To some degree they are not to blame, they have not been taught anything about it other than that it is evil and wrong and they would be rejected by their colleagues if they suggested alternatives.I am not saying that this will cure anyone, but I have seen dozens of people that it has helped and dozens more that are just starting, but already showing improvement. Please whatever you do, research first. I am so happy my mom is feeling better and I want to be able to help everyone else who’s parent, sibling, child, friend or self has canecr, I know how it feels to watch them get worse and watch the treatment make them more sick. Good luck!! My prayers are with your family. excuse pb with computer. It started in 2008. A breast cancer with a tumor in yhe axilla.. I saw some years before my sister (47) died, not because of her cancer, but she was literaly burned and detroy by chemo. She didn’t looked like my sister anymore.So I didn’t want to follow her way.I was involved in alternative medecine for a long time.First I escape in India to get a surgery, because in France no one wanted to operate me without chemo and ray. So, It would be ok during 3 years. But it came back because of so many emotional problèms I got. At least I could be operate by a french sugeon who was aware and accepted that I refused chemo.This man became after my fellow (what a beautifull love story!). But cancer is still there, making many many probèms, pains, mecanic problems and so on. Surgery is not usefull anymore. We new about the Linus Pauling research. But you can’t imagine in France how it’s difficult to optain informations. At least i’st done.My friend (François) put me under the skin a “portacath” witch is a small box directly in contact of the veins, more easy for injections. We started 2 days ago. We started with medium doses, and will grow up to 85:100g a day. We will add also Glutathion, witch is very important, and also vitamine B17 very effective as ell. Now I’m like an encyclopedy abouty alternativ ways, and I know where to obtain products, and the name of clinics whitch can provide the treatment. For me, I just now to wait and see, the treatment just begun.If you need informations, dont’t hesitate. Of corse you can use Vit C with chemo, but it will just clean the desaster of chemo. not put your chemo more effective.chemo is poison, witch never cure nobody, just putting some of them very rich! Best Regards. Hélène. Where can I get vitamin C intravenously in England? I have been diagnosed with 1C clear cell carcinoma of the right ovary. I have had a total abdominal hysterectomy and have just had my third round of chemo. Please help. My mum is suffering from advanced lung cancer. Could you provide the details of a doctor who works with cancer patients in Perth with the intravenous Vit C. She lives in Duncraig in the Northern suburbs. My lung Cancer has just begun to increase as well… after it has been still for just over 3 years. I now want to try the intavenous Vit C as well… I also live in the northern suburbs of perth and am interested in who might give the Vit C treatment…… I do know there is a Cr Nuttall in Midland, but I didn’t want to have to go that far. i am desperately trying to find out where to get intravenous Vit C injections for my father who has cancer. We are in Perth Australia – any ideas? I am in France now with my husband who has colon cancer and we are looking for places in France to do the IV Vitamin C treatments. I was told by a doctor here that IV vitamin C does not exist in France. Is that true and if so, do you order your vitamin C from another country? Do you know of any doctors in France who would do this treatment? We are in the southeastern part of France. My brother has been diagnosed with pustular psoriasis and his is not curable just eating off his hands and feet. We are willing to do the vitamin therapy just don’t know where to go near indiana USA. Any help is very much appreciated thanks. How is Mum? How long has she been doing the vit c therapy now? Would be helpful to date the blog. Best wishes and thanks. I.V. Vitamin C is not available in Australia, I was in a major hospital diagnosed with swine flu, I had ampules of high doses of vitamin C 7 asked that they be put into my I.V. Not only did they refuse, they confiscated my own property, they refused to give it back. My own doctor was not allowed to treat me, I was too ill to leave. Where there is a will there is a way so I took an alternative action which I believed saved my life. I read about the Intravenous Vitamin C therapy article on your website and found it to be incredibly useful.My mother has been diagnosed with lung cancer this April and I wanted to provide her the IV C therapy.I wanted to ask if any general physician can perfom this therapy or experts are needed as apparently none of the doctors in our country(India) practice this therapy. Please guide us what to do.